Many of you will have seen that the hot weather in the last few weeks has caused fires on Saddleworth Moor in Manchester. UK Wildfires are costing the UK’s water companies millions of pounds and they also pose a risk to the quality of our water supply. Climate change predictions suggest that the UK will see more extreme wildfire weather in the future. Fire is almost certain to become an increasing factor affecting the condition and longevity of some woods and forest areas in sensitive areas, and climate change is likely to be a contributory factor. Prior to 2012 wildfire was barely recognised as a significant hazard in the UK but now it is costing around £55 Million per year in response costs. 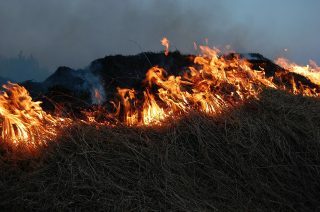 With regards to water quality, discolouration is a likely outcome of wildfires, because “deep” burning into the soil “destroys the seedbank” and prevents natural re-growth of vegetation, making it easier for soil and minerals to infiltrate the water system. In addition, “in some parts of the country there are heavy metals that are deposited in the peat, remaining from the industrial revolution. These deposits may also be more likely to get into the water course” as a result of unmanaged wildfires. So if you are off camping in the holidays, here are some tips on how to prevent wild fires. Always make sure BBQ, s and heaters are extinguished properly. Discarded bottles can cause wild fires so dispose of them responsibly. Do not discard any cigarettes, matches or flammable products from moving vehicles. When camping, take care that fuels for stoves and any flammable liquids or gases are stored safely.